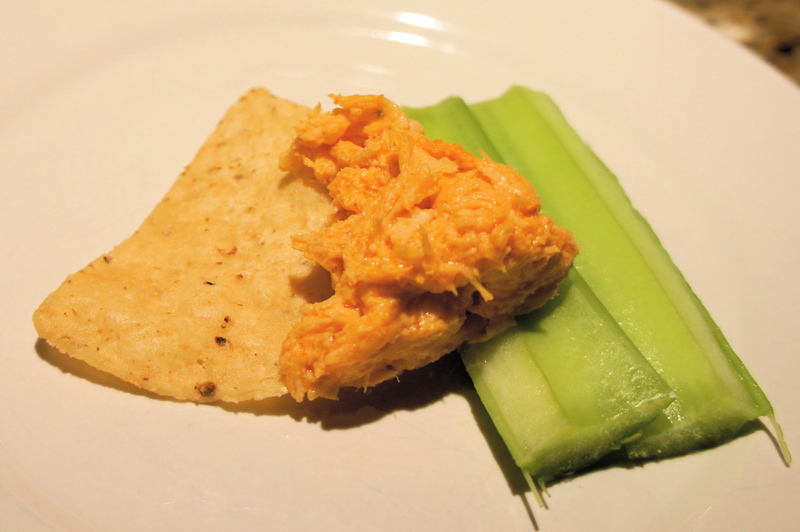 Buffalo Chicken dip. Nough said. There are two easy ways of doing this. Crock pot versus stove. -Put chicken breasts, butter and hot sauce into the crock pot. Set on High. -Once chicken is softened and beginning to look stringy and pulled, add in cream cheese, cheddar cheese and dressing. -Mix together until totally blended. You should see the chicken start to blend in and fall apart even more. -Let it all heat up thoroughly before you serve – it’s done once it starts to bubble (this will happen quickly). -Once chicken is cooked through (10- 15 minutes depending on thickness), remove from water and set aside to cool. -Once cool, pull it apart with two forks, creating pulled chicken. -In a large mixing bowl, add in cream cheese, cheddar cheese and dressing. How long would it typically take in the crock pot and I have 5 chicken breast… Big family what would you recommend me upping the measurements to? I would say just below double the whole recipe if you are using 5 chicken breasts. If they’re frozen they will probably take 3 hours.. But if they are defrosted then they’ll only take about an hour to cook through and another 30-60 minutes to start to fall apart and shred. The great thing with the crock pot is that you can’t really overcook it, just set it and go do your errands!